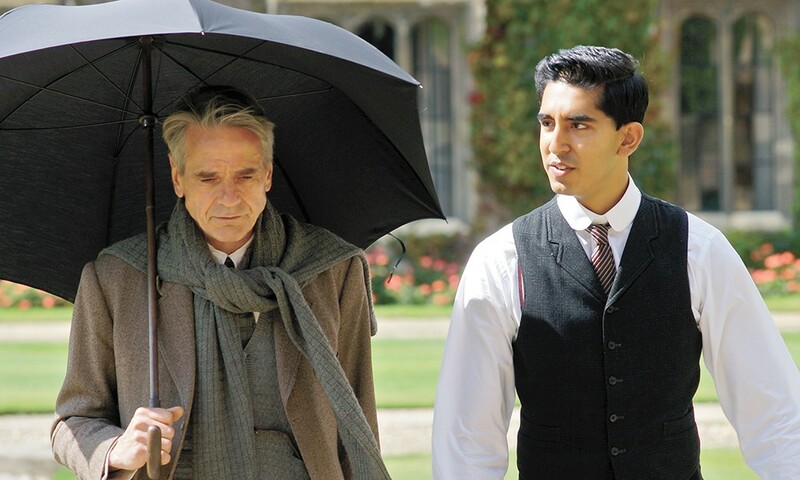 Jeremy Irons (left) and Dev Patel star in this historical drama. Falling prey to the great-man biopic syndrome, The Man Who Knew Infinity takes a reverent stance toward its subject, mathematician Srinivasa Ramanujan, played by Slumdog Millionaire's Dev Patel. The dutiful portrait, along with the obscurity of the film's mathematical formulas and postulations for the general viewing audience, is likely to make this outing seem more slog than jog. Yet even though the details of Ramanujan's genius were lost on me, the film introduced me to this towering figure in his field, a man about whom I previously knew nothing. A helpful epilogue explains that Ramanujan's 100-year-old theories have now proved critical in the study of black holes — the most practical takeaway I gained from the film. Adapted for the screen by writer/director Matt Brown from Robert Kanigel's book The Man Who Knew Infinity: A Life of the Genius Ramanujan, the film primarily focuses on the relationship between the prodigy Ramanujan and his Cambridge University mentor G.H. Hardy (Jeremy Irons). Although the young Tamil man received some formal schooling, his mathematical abilities were self-taught, or as he later explains to Hardy, they are expressions of God. Hardy, an avowed atheist, was quick to perceive Ramanujan's genius and arrange for him to come from India to study in England, but was mightily frustrated by the young mathematician's lack of proofs for his theories. This push and pull between pure mathematical assertion and Western academia's need for meticulous substantiation provides the crux of the movie, along with issues of class difference that prevented these exemplars of the British Empire from viewing the dark-skinned Tamil as a potential equal. World War I somewhat disrupts the serenity of the Cambridge campus, requisitioning young men for the war effort and setting up hospitals on the college quads. A love story that continually cuts back to Ramanujan's wife pining at home in India is prolonged and unproductive. In the final third of the movie, Ramanujan begins coughing portentously, all while trying to hide his tubercular condition from Hardy. (He's not as successful in this pursuit with the audience.) None of this impedes the men's research, but after a sanatorium stay, Ramanujan returns to his wife in India. Sadly, he died a year later in 1920, at the age of 32. The Man Who Knew Infinity is not showing in any theaters in the area.